Beautiful 2 Bedroom Villa across the street from the beach and beach club pools and restaurant. 2 bedrooms, 2 full bathrooms, sleeps 8. NEWLY RENOVATED BUILDING! Enter a gated community, nestled among mature live oaks and lush maritime forest, and it is on the ocean! How can you beat this? 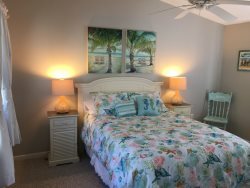 Across the street from the beach, this beautiful 2 bedroom villa is on the top floor, overlooking the Crooked Oaks and Ocean Winds golf course. Step out your door and you are at the Seabrook Island Beach Club with beautiful swimming pools, the ocean, the beach and the golf course. Each of the bedrooms has 2 Queen beds, a wall-mounted flat screen TV and a private bath. The open floor plan features a comfortable living room with a large wall-mounted flat-screen plasma TV and DVD player, a dining area that seats 6, and a fully equipped kitchen with stainless steel appliances, tile flooring and granite counter tops. Sliding glass doors open from the bedrooms and the living room to a furnished deck with a dining table for 6 and another table for 2 looking out over the golf course. The Club at Seabrook provides access to two championship golf courses, the Equestrian Center, ocean front pool complex, and all dining options inside the security gate. It also provides access to the Racquet Club with state of the art facilities and top quality clay courts. To access these facilities a Club Amenity Card is required and additional fees will apply based on the activity you choose to use. Rental guests in this property will be charged $25 per day, $150 per week, or $210 per month for the Club amenity access cards. Amenity cards are included with rentals of 4 nights or more. You are a bike ride from Fresh Fields Village with abundant shopping, grocery store, liquor store, medical facilities, both casual and fine dining restaurants and much more. The Village Green has entertainment most Firday nights during the season. You are also a bike ride away from Bohicket Marina with more shops and restaurants, spa, boating and fishing activities. There is also music here on most Thursday, Friday and Saturday nights. Seabrook Island is 30 miles from historic Charleston, with both carriage and walking tours, museums, shopping, abundant restaurants and entertainment. Seabrook Island is 35 miles from historic Magnolia Plantation and Middleton Place. The Atrium Villas have free covered parking, elevator access, initial supply of linens and towels, washer and dryer, and a starter supply of paper products and detergents. There is local telephone service and 24-hour security in this gated community. Wireless internet services are not guaranteed to work with your equipment. The wireless service operates on an open network that requires no logins or passwords and provides no network security. The Lake House complex as you enter the gate also has wifi, as does the coffee shop at Fresh Fields. Each of the 2 bedrooms has 2 Queen beds, a wall-mounted flat-screen TV and a private bath. May activities and restaurants and shops close by at Bohicket Marina and Freshfields Village. A 35-minute drive to plantations and scenic historic downtown Charleston. Dining:Dining table in villa seats 6 and dining table on deck seats 6. Fitness Room / Equipment: Fitness center at The Lakehouse, with a daily fee. Bicycles:Can be rented from Island Bike and Surf, 843-768-1158.